As one of Telecentre‘s main initiatives, the Telecentre.org Academy pursues capacity building of telecentre staff, network leaders, policy-makers, and social investors worldwide by developing curricula, standards, accreditation and certification programmes in collaboration with telecentre networks and academia. It strives to empower telecentre actors and other stakeholders to achieve inclusive growth and socio-economic development of telecentres at the grassroots. Spearheaded and managed by Telecentre.org Foundation, it is composed of affiliated national academies and supported by a Global Secretariat hosted by the Indira Gandhi National Open University. 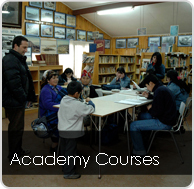 The Academy has developed a global curriculum in Telecentre Management, which is in the process of being translated and localised to suit the needs and requirements of telecentre workers worldwide. You can download the Telecentre Academy brochure here. For more details, please contact the Capacity Building Manager.